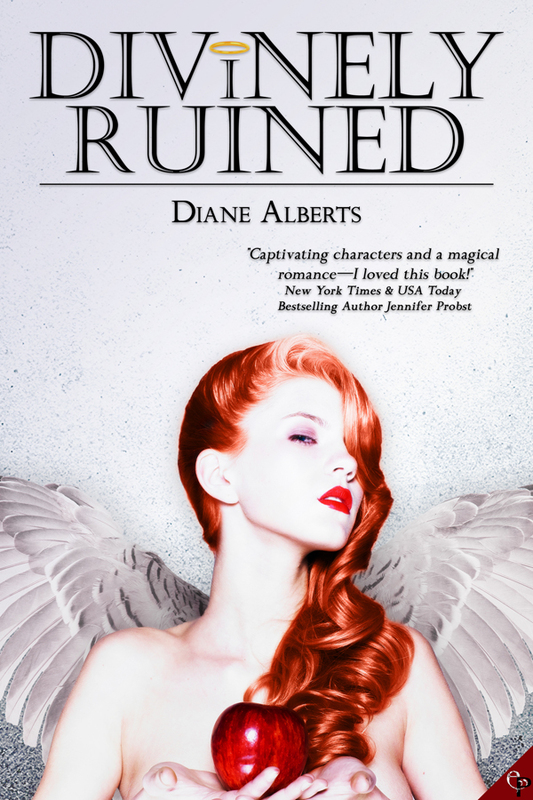 Rachel Lyndhurst: DIVINELY RUINED from Diane Alberts COVER REVEAL! DIVINELY RUINED from Diane Alberts COVER REVEAL! It feels like it's been raining forever here in the UK. It's dark and it's cold and it's not too pretty considering it's supposed to be spring. But I've got something for you here that's very pretty indeed! DIVINELY RUINED, from Entangled Publishing and the author who brought you ON ONE CONDITION, is hitting the virtual shelves on Thursday, April 26th, but you can get a sneak peek at the cover and blurb right here right now! Rebecca's life sucked before she became an angel. Crappy apartment, awful jobs,abusiveb oyfriends--it was no wonder she jumped at the chance to escape it all and become a real live angel. The problem is Rebecca's not very angelic,and she'll have to do more to earn her wings than end her love affair with the word f--er,frick. Especially when she's assigned to save single father Tony Weis, whose less-than-pure thoughts wreak hell on a telepathic angel's nerves. It's all Rebecca can do tokeep her hands off him...but when she loses her memory injuring herself to saveTony's daughter, now it's Tony's turn to be her angel and care for her.But will Tony's devotion tempt her from her angelic path, even if it means being human again? Something for the weekend with Barbara Wallace! Nina Croft picks a winner!